After a sumptuous dinner at &Samhoud Places, we followed this up with another lovely meat at Yamazato Restaurant which located in The Hotel Okura in Amsterdam. Yamazato is famous for its authentic Japanese haute cuisine, and in fact Yamazato was the first traditional Japanese restaurant to be awarded a one Michelin star in Europe. 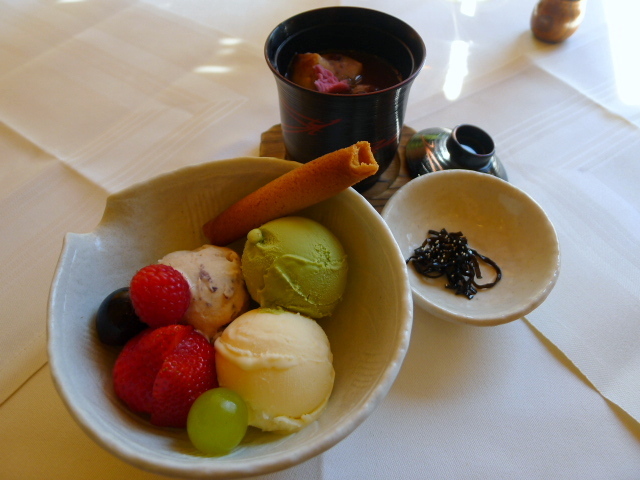 The restaurant is best known for its kaiseki menu, a multi-course Japanese menu that draws upon seasonal ingredients and a collection of skills and techniques in its preparation. 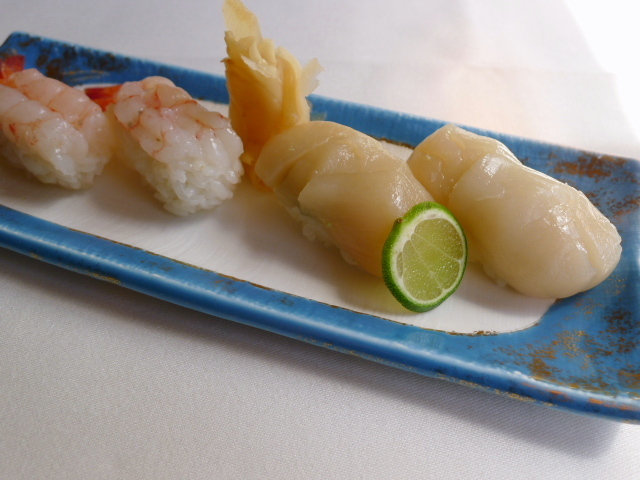 But Yamazato also offers a wonderful variety of classical Japanese dishes from the a la carte menu, a selection of sashimi and sushi, and a more moderately priced lunch menu. Decorated in a 15th and 16th-century Sukiya style, the décor at Yamazato embodies the essence of a classical Japanese fine dining restaurant. The waitresses were all dressed in kimonos and well trained in the art of fine Japanese hospitality. 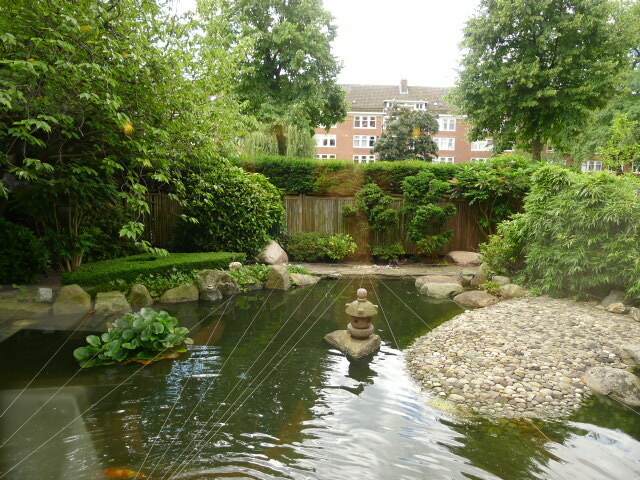 Surrounding the restaurant is a Japanese garden, beautifully landscaped to exude a sense of calm and serenity. The décor, the lovely service and the garden all went hand in hand in to create a harmonious dining experience. 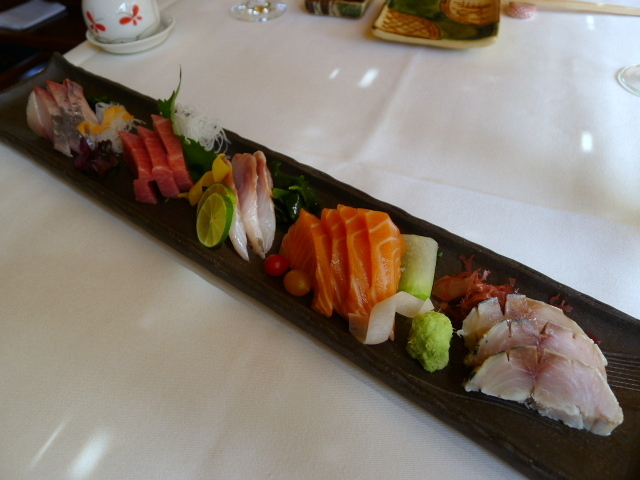 We started with a selection of sushi and sashimi, all of which were priced per piece. 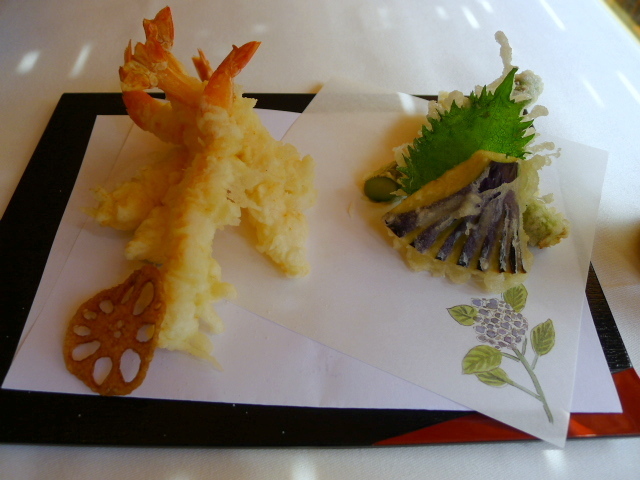 The sweet shrimp (€5) and scallop (€6) were heavenly, particularly the scallop which had been served with some fragrant shiso. The scallops were fat and juicy and delectably sweet. In fact all the sashimi that we tried – yellowtail (€6), toro fatty tuna (€7), sea bream (€5), salmon (€4) and mackerel (€4) – were also excellent. The fish were of the finest quality, had been perfectly sliced and oozed with flavour. The prawns in a dish of prawn tempura (€28) were as sweet as they come and wonderfully firm in texture. But the batter was a little disappointing. Although it was light, it wasn’t as crunchy as one might have expected and it consequently let the dish down. 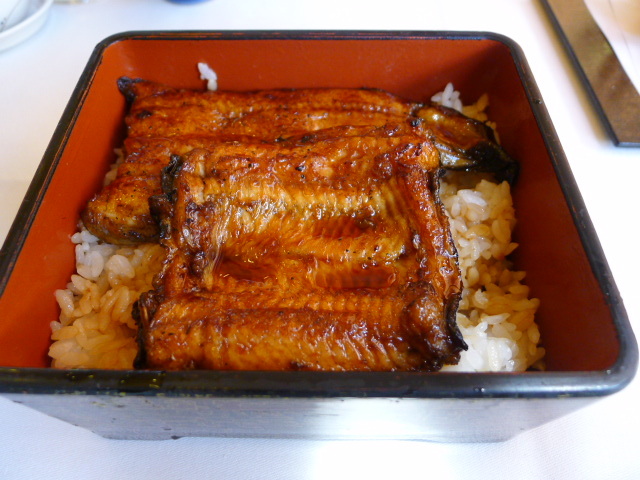 Eel steak with kabayaki sauce (€32) had been perfectly cooked and oozed with softness and flavour. The sauce, similar to a sweet soya sauce, had been expertly prepared and was very authentic. However, I would have preferred a touch more sauce to give this dish more flavour. 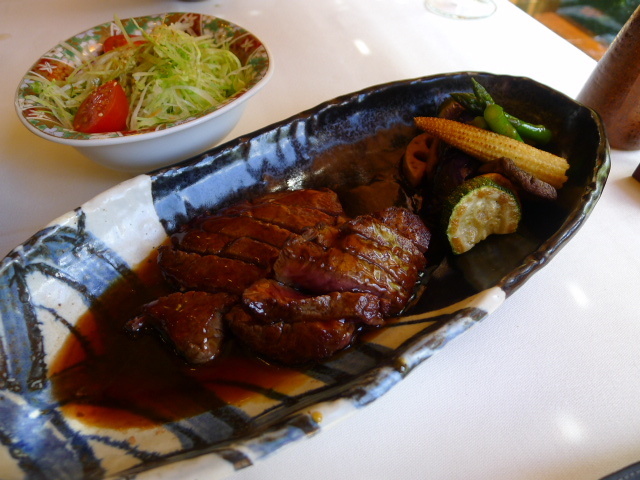 Grilled fillet mignon with a teriyaki sauce (€42) was heavenly. The fillet was gloriously tasty and incredibly tender and had been cooked to the requested medium rare to maintain its succulence. The teriyaki sauce was also wonderful and light. For dessert we tried a soup of sweet red beans and rice cakes (€8.50) served warm, as well as portion of red bean, grean tea and sake ice cream. The soup was not too sweet and the rice cakes were gooey and light, and the ice creams proved to be creamy and smooth. There’s good Japanese and then there’s refined Japanese, and Yamazato fell into the latter camp. In some respects it was a simple meal. But it was the outstanding quality of the produce treated with a sophisticated and delicate touch that made all the difference. Furthermore, the serene setting went a long way in creating an authentic Japanese dining experience. The highlights included the wonderful sushi and sashimi and the excellent fillet mignon. We found the tempura to be disappointing but we would still go to Yamazato again for its sublime sushi. Yamazato wasn’t cheap, but there is a very reasonably priced €50 lunch menu. Tasting menus: From €75 to €115. A la carte: About €100 a head.